For those that are regular readers of my blog, you know I like to travel well – private tours, luxury resorts, and spa treatments. However, I set my usual preferences aside for this trip to focus on having a truly authentic experience (Except for my business class flights!) This is my usual train of thought when traveling to Europe because hiding behind a fancy resort will cause you to miss out on so much history and culture. In my honest opinion, you travel to Europe to be active; to go out and see and do as much as possible. Why waste it in a dimly lit room while wrapped in sea weed? Anyway, off my soapbox. So, why was this trip more authentic? Hurtigruten Norwegian Coastal Cruises are working ferries- they carry goods and cars along the coast to the various smaller villages and cities that are otherwise hard to get to by land or may not have regular access by air. Locals use the ferries as transportation since it can often times shave hours off of a journey. 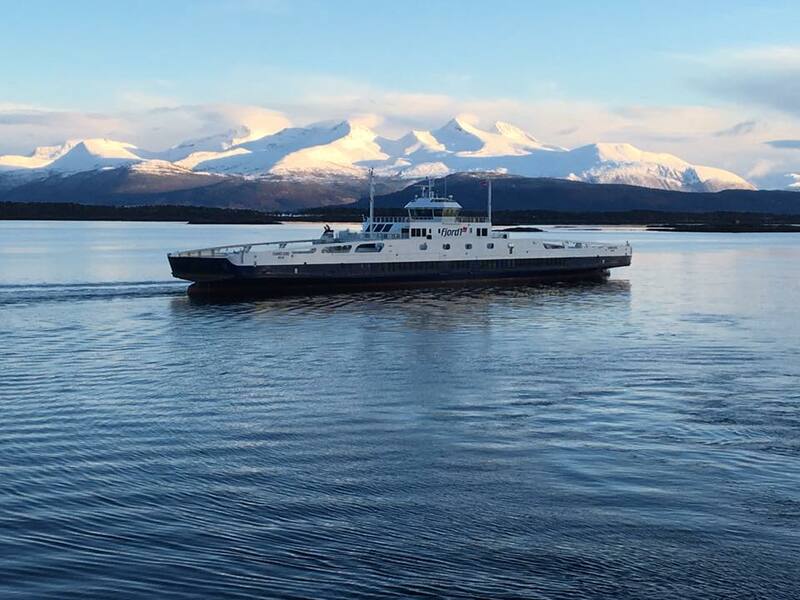 Due to its working purpose, Hurtigruten stops at many ports during its journey – over 30 one way to be exact! As the ferry serves the ultimate purpose of serving these coastal communities, stops are made 24 hours a day as the ferry makes its way up and down the coast. 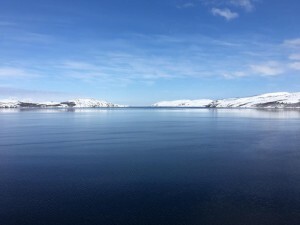 For those using the ferry as a vacation, Hurtigruten allows you to join the voyage for as little or as long as you’d like. 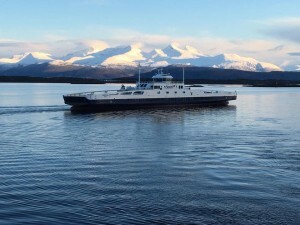 You can partake in a one way northbound journey starting in Bergen, a one way southbound journey starting in Kirkenes, a round trip journey starting in either location, or a port to port journey (example- Bergen to Trondheim or Trondheim to Tromsoe). Due to the timing of when the ships depart, the northbound journey is 6 nights while the southbound journey is 5 nights. If you combine the two legs, your entire trip ends up being 12 nights. When doing the round trip, the ports visited in the middle of the night on the first leg will be visited during the day on the return. 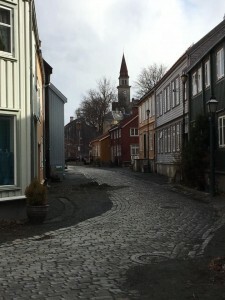 The ports range from larger cities, like Trondheim, to small villages like Mehamn, with a population of about 730 people. The ships winds its way up and down the coast, going through the many majestic fjords and the stunning Lofoten Islands, poking out into the open sea only a few times throughout the trip. The particular itinerary I chose for my trip was the Southbound Coastal Voyage, with a special Expedition Team. 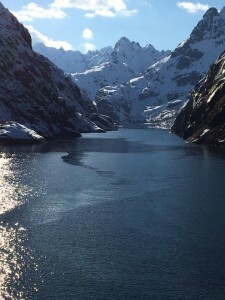 The expedition team leads activities on and off the boat, to include hikes and lectures. I’ll go more into the activities in a bit, but I wanted to point out that there are variations in the Coastal Voyages and the boats that operate them. 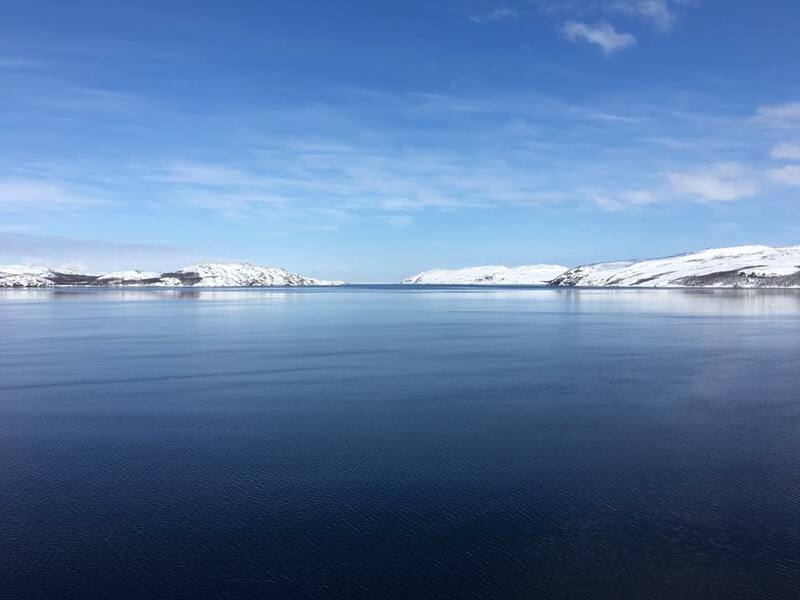 Some boats do not accommodate an Expedition Team and some sailings are even further niched, focusing on the Northern Lights, Viking History, or WWII history. So, if you have flexibility in your travels, and have a special interest, I recommend working with me (your friendly travel agent!) to choose the best voyage for your interests. Also, as an aside, Hurtigruten also offers sailings that include Svalbard, Greenland, or even Antarctica! 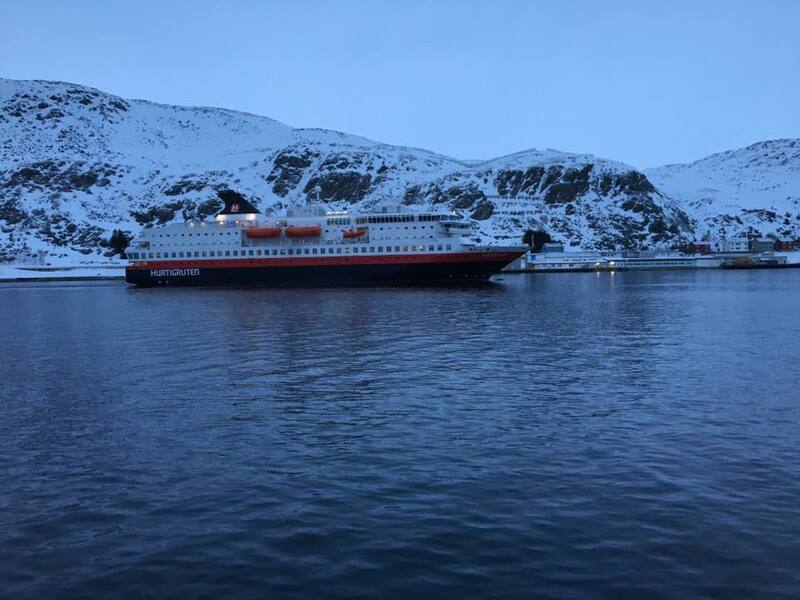 I had read online to expect that the Hurtigruten ferries were not lavish by any stretch and to put yourself in the mindset that you are on the boat to explore and not for the accommodations. So, I did just that- I put myself in the mindset that my expectations would be low. However, I have to say I was pleasantly surprised by the boat, the furnishings, the quality of the food – really everything! Yes, it is not luxury. However, I’d say it’s the equivalent of a floating Sheraton. Up to date, yet nothing frilly or fancy. The MS Nordkapp, our home for the 6 day journey, had recently been renovated, so the ship always looked well maintained, clean, and modern. There are two restaurants on board – the main restaurant where all meals are served and the a la carte restaurant. I had full board included in my fare (minus beverages) but you can choose to upgrade to the a la carte menu at any time. The full board included a huge breakfast and lunch buffet as well as a set dinner menu each evening. The set menu included an appetizer, entrée, and dessert, all of which was designed around local Norwegian cuisine. For a picky eater such as myself, I found myself having a lot of bread, but the kitchen is willing to work with you if you have strong dining preferences or allergies. The one thing I thought strange was that coffee and tea are included with breakfast but not at lunch or dinner. I never stepped foot in the a la carte restaurant, and to be honest, I never saw many people in there at all. The main restaurant’s offerings were enough to seemingly satisfy the masses. One thing I liked was that each time you entered the restaurant, you flashed your guest card to check in, but you were also required to use hand sanitizer. As a non-cruiser, I have heard so many stories about illness spreading like wildfire, so it was certainly a concern for me. I was quite pleased to see people being diligent about hygiene. Anyway, in addition to the two restaurants, there is a bistro, which serves pizzas and sandwiches, a bakery, and a bar area with a few appetizer type offerings. I did not eat at the bakery or the bar, but had a pizza at the bistro on two occasions. It’s no slice of NYC pizza, but then again, what is? As with most cruises, you spend some time at sea. So, most Hurtigruten ferries have a vast collection of seating lined along the windows. You can chat, sip wine, read the paper, or just stare while enjoying the views. The ferry also includes an on board gift shop, laundry facilities (for an extra charge), an outdoor Jacuzzi (which was not running during our voyage), heated outdoor terraces, and even a fitness room. My husband will attest that you are probably best getting your exercise in doing some of the organized walks. Running on the treadmill while the boat sways back and forth is quite interesting. The cabins are quite basic, and small, but I never felt too cramped. I booked an Arctic Superior Room, so I had a larger window looking out toward the water. One thing I did not think about prior to booking was what side of the boat I should book to get the best views. When traveling Southbound, you’ll get the best views from the port side (left). Alternatively, if you are traveling Northbound, try to snag a room on the starboard (right) side. My particular room had a queen bed, which was a surprise, given that I was prepared to sleep in a separate twin bed from my husband. I found the bed to be comfortable and I slept well for most of the trip. The bathroom was always clean, and had a heated floor, but be prepared for a lack of lotion, as well as a hair dryer, though there was a steady supply of shampoo and conditioner. The suites on board offer these additional amenities, however, I noticed that Norwegian hotels do not typically offer lotion bottles in their standard room categories. So, be armed with some from home, or buy some prior to boarding the ship. The shower was a little difficult to move around in, but it had warm water, which was so incredibly welcomed during our time above the Arctic Circle. So, now on to the fun parts of the voyage. Many of the ports visited by the ferry are super small and the stops are just long enough to load/unload cargo and cars. Obviously, a 15 minute stop is not long enough to do much exploring at all. You might be able to get off the boat, stretch, and get back on. For the shorter stops, I just stepped out onto the outdoor decks and took pictures. However, I tried to take advantage of most of the longer stops and enjoyed a few on board activities. The best, and most expensive, activity offered was the Polar Night Snowmobile trip. We got off of the boat in Mehamn at 1:15am and did an 11km snow mobile trip across the Finnmark tundra and met back up with the boat at Kjollefjord. While this activity would be even more amazing when the Northern Lights are active or during the Midnight Sun, it was still fun (and seriously cold). We also enjoyed (aka struggled) on a hike through the snow in Hammerfest, a village tour in Bronnoysund, and a city walk in Trondheim. We absolutely adored Trondheim, which was good, because I ended up back there for some meetings later in the trip. So much to see and do and totally scenic. 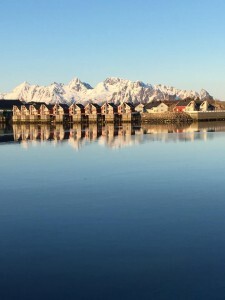 There were a few other activities available, including a bus tour along the Atlantic Road, fishing or horseback riding in the Lofoten Islands, and a midnight cathedral concert in Tromsoe. Most of these activities were led by someone from the three person Expedition Team, which also gave lectures on the ship. The lectures ranged from silly storytelling and folk dancing to experiencing local culture or foods. The lectures were clearly geared toward the older clientele on the ship, as most people were over the age of 50 (or really, over 60), but we still enjoyed them as it gave us something to do while out at sea and a chance to interact with other guests. I really enjoyed having the Expedition Team on board and I hope Hurtigruten rolls this concept out to all of their voyages. Upon arrival into our final stop, Bergen, I was sad that the voyage was over, but thrilled to be able to remove my seasickness patch, as it was starting to cause blurry vision. I also had a horrible case of sea legs for the next few days. I had to work around a specific set of dates for this trip, but I would recommend timing the trip around special sailings, such as the Northern Lights or Midnight Sun. The weather ranged from frigid cold up north to mild in Bergen and I probably would have been more tolerant of the cold if I saw the Aurora. Also, based on pictures, the scenery is just that much more stunning in the summer months. Be prepared to pay more for the summer sailings, as well as the special voyages, but there is a reason for that. I’m just glad I was able to see the fjords and take advantage of an opportunity I may never get again. While my other half left me here, I continued on to Oslo, Trondheim, and Amsterdam. I should also mention that we stayed the night prior to the cruise at the Thon Kirkenes. The hotel is nice and extremely close to the Hurtigruten terminal, but Kirkenes is not very exciting. If you do end up there, and you are a history buff, I recommend visiting the Resistance Museum, even if most of the exhibits are in Norwegian. If you dare to get as close to Russia as possible without actually entering the country, there is a river boat tour along the border. Kirkenes itself is only 6km away from the border and you can certainly see the blend of the two cultures there. So, my recommendation would be to spend your extra time in Bergen. Prior to heading into downtown Oslo, I stayed at the Radisson Blu Airport Hotel. Great hotel for something so close to the airport. Super convenient. In downtown Oslo, I once again stayed at the Thon Rosenkrantz. You can read my review of that here. In Trondheim, I stayed at the Scandic Nidelven. I thought the location of the hotel was great and, even better, the breakfast was phenomenal. The room itself was basic, and needed a little bit of a face lift, but it was sufficient for my stay. During my return trip in November 2017, I got an upgraded room with a partial view of the water. The decor was nicer, but the room was the same size and the bathroom was exactly the same. If staying at this hotel, I recommend getting a room facing the water. I have also stayed at the Radisson Blu Royal Garden Hotel, which is just down the street from the Scandic. The rooms are very similar to the Scandic in size, but I felt the Radisson was a bit more updated. It could be that I had an upgraded room that faced out toward the water. Even though I stayed there for more than a week, I never got to eat breakfast. I hear it rivals the Scandic. Overall, I was pleased with the Radisson – it was clean and quiet. I ended my trip in Amsterdam, but stayed with a friend and did not do many touristy things. However, the weather was gorgeous during my stay and I thoroughly enjoyed our canal cruise. You can read more about my previous Amsterdam trip here if interested.